A day after Tamil superstar Rajinikanth said that he might entertain the possibility of joining politics, parties have welcomed his statement saying it would change the equation of the state. Welcoming the same, the Bharatiya Janata Party (BJP) on Tuesday said if Rajinikanth entered politics, a credible alternative would emerge in the coming days. 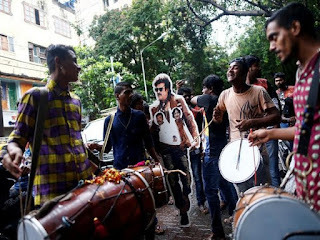 BJP leader S. Prakash said that many personalities from the tinsel town have ruled the state and the the kind of popularity Rajinikanth enjoys, his entry would change the equation in the state. Even the Congress opined the same and said he would bring good to the state. Claiming it to be a 'political accident', Rajinikanth who held a 'darbar' with his fans after a massive gap of eight years, admitted yesterday that he committed a mistake by supporting a political alliance 21 years ago. Continuing to maintain his intriguing stand over joining politics, Rajinikanth further asserted that some people used his name for 'political gains'. Addressing his fans in Chennai, the superstar said, "Some of my fans urged me to join politics and it's not bad even to enter politics, but making money out of this is bad." However, the star added, "If in case I decide to join politics, then those making money will not be entertained." "God made me an actor and I promise Rajini will never ever disappoint his fans in acting," he added. In 1996 Rajinikanth had lent his support to the DMK-TMC (Tamil Manila Congress).